COME MY LADY: Crazy Town Are Back?! Hey guys and gals, I think we have finally figured out what that empty hole residing in each of our hearts has been missing – Crazy Town. 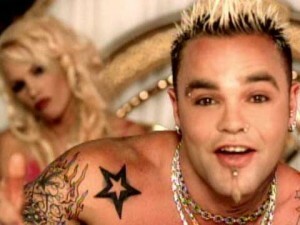 Formed in 1995 by Bret Mazur and Seth Binzer, Crazy Town had a run of singles in the early 2000s, but the track everyone still shutters when they hear is unquestionably their smash “Butterfly.” Between 2000 and 2001 “Butterfly” was single-handedly responsible for causing more poor decisions while drinking, not to mention (and sometimes including) teen pregnancies, than any other song released in that time. Okay, maybe that isn’t a “real fact,” but I dare anyone to find a challenger willing to step to Shifty Shellshock and crew. Anyway, Crazy Town has decided that it is time to return to music, and earlier today their official YouTube launched a brand new teaser. The clip, which may or may not feature new music, can be found below. Few details other than the fact something is “coming soon” are given, but it’s still worth a watch if you have somehow forgotten what this duo is capable of creating. We’re trying our best to reserve judgment until a single surfaces, but I’d be lying if I said I thought this was a good decision. Comment below and let us know your thoughts. I will forever know this band for three things: 1. using a sample of the Red Hot Chili Peppers that no one realizes is RHCP sample. 2. having to have Flea personally teach their bassist how to play said song 3. if I’m not mistaken, being the only band Led Zeppelin’s former manager still manages. Overall, big wtf. Big, big wtf. I noticed at the end of the teaser that they walked passed Posers on Melrose in LA. There’s a girl with a mohawk that works there and spends most of her time hanging outside the shop, smoking, and giving every passerby a look of utter distain. I can only hope that when this no-so-dynamic duo was walking past, that just off screen she’s giving them a death-stare with a little extra derision. Butterfly totally used to be my jam when I was way too young to be listening to it.